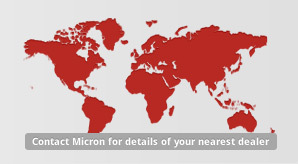 The Micronair Application Monitor is a complete spray monitoring system for any aircraft. Liquid flow is measured by the proven Micronair Flowmeter Turbine, which is connected to a microprocessor-based electronic unit. This takes the liquid flow rate, together with the swath width and ground speed of the aircraft, and computes all the vital parameters of the spray operation. 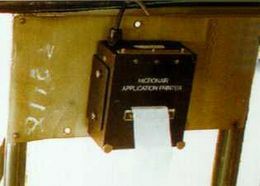 The Application Monitor has been designed for simplicity of operation. 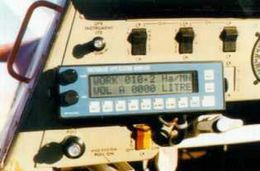 The large, clear liquid crystal display gives prompting messages to the pilot in plain English from the moment the unit is switched on. The display is provided with an adjustable back-light for use under poor lighting conditions and at night. All set-up parameters (swath width, ground speed, calibration details, etc.) are stored in a non-volatile memory. This enables the unit to be prepared for use by pressing only two keys. The unit can be programmed by the user to operate in metric or imperial (US or Standard) units. The Application Monitor can be calibrated to work with either of the two flowmeter turbines. This provides maximum flexibility for operators who require a wide flow range. Both the turbine and the electronic unit have been designed to withstand the tough environment of an agricultural operation. The turbine is manufactured from stainless steel and tungsten carbide for maximum resistance to agricultural chemicals and the electronic unit is housed in a sealed aluminium case. Real Time Application Rate: In litres/ha or gallons/acre, calculated from swath width, ground speed and flow rate. Real Time Flow Rate: Liquid flow in litres or gallons/min. Totaliser: Display volume applied in litres or gallons or the total spray time for each spray job. Resettable. Area Treated: This is the total area covered (ha/acres) whilst spraying. Area Treated per Minute: This is the anticipated area (ha/acre) sprayed per minute, based on swath width and ground speed. Atomiser RPM: The Application Monitor will display atomiser rotational speed for up to ten Micronair atomisers. GPS Compatible: The monitor can be integrated with GPS (Global Positioning Systems) to accurately record application details. 7.6" x 2.3" x 2.3" (193 x 58 x 33 mm) excluding connectors, etc. 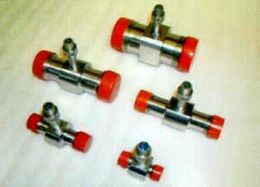 Supplied with 2" dia ends to suit standard spray systems. Other diameters and dual turbine pipework available; please specify aircraft type when ordering. 3.6 - 7.3 lb (1.6 - 3.4 kg) depending upon size of turbine.